This video will honestly either make you want to dry heave into a paper bag or fill you with utter joy; it’s ever so slightly sentimental andI use my “mummy voice”. You have been warned. I went to Lapland on a press trip recently and wanted to film something for Ted and Angelica to show them what I get up to when I go away (sledding, ice-fishing, staying in a treehouse – standard), but then I thought, why not just put the video out there and see how it goes down? Maybe people love being spoken to like a small child – it could be a new trend. An ASMR kind of thing. Regression therapy. Granted, the sled ride and ice fishing would have been very interesting to a three and two year old, but for it to be properly appealing it all needs to be Disneyfied these days; ice fishing with mummy is boring, ice fishing when a talking cartoon penguin pops up out of the ice hole and launches into a power ballad would just about be acceptable entertainment. The bar is set high. See how you get on with this – if you’d like more videos that make you feel like a tiny child then do be vocal about it. It can be arranged. Although the amount of swearing I had to edit out – bloody hell! It was like a constant stream of profanities and inappropriateness! Especially with Nadine Baggott as sidekick. By the way; if you want an adult version (steady!) of my video then do watch Nadine’s. I’ve popped the link below the video screen. Nadine’s vlog is on her channel here: https://youtu.be/cInSYuZ6Ak8 [AD info: this is not a paid-for or sponsored video. I went on a press trip with beauty brand Lumene. My snow outfits were gifted by various brands as part of the trip – please see below for more details.] 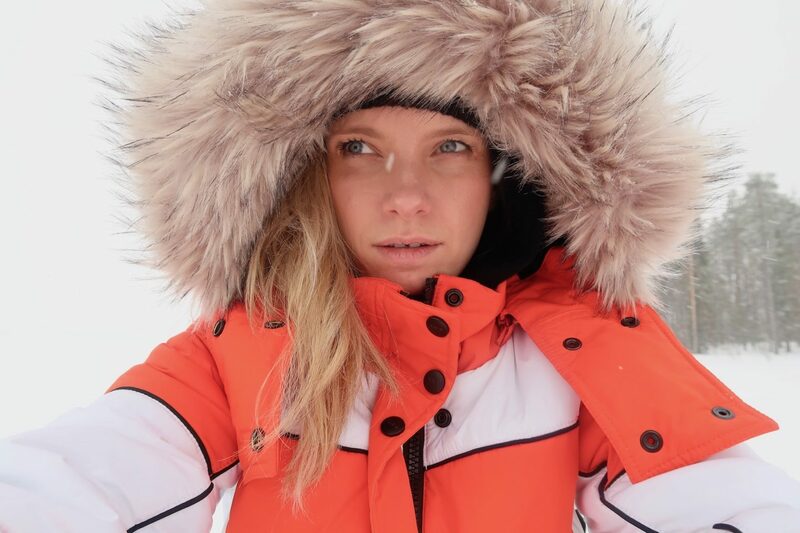 Lumene’s website: https://www.lumene.com A tour of my room at the Arctic Treehouse: https://youtu.be/qP3cRWwBrmY My snow jacket and snow bodysuit are from Topshop, my salopettes are Sweaty Betty and the snow boots are Sorel. OK. Now all I can think about is a compilation video of a baby-voiced for-toddlers vibe interspersed with real-life swearing. Please, Ruth. the world needs this. This is such a lovely video! What a delightful video for your kids. I was imagining you as a child TV presenter. Here in Oz we have Play School, an iconic TV show that all kids grew up on and you sounded like you would have belonged on there. I wouldn’t exactly say that I like to be spoken to like a little child – in fact I am very sure that I would majorly dislike it in most circumstances, but I still was filled with utter joy by the video. Maybe because mine are about the same age as yours and I kept thinking about them.